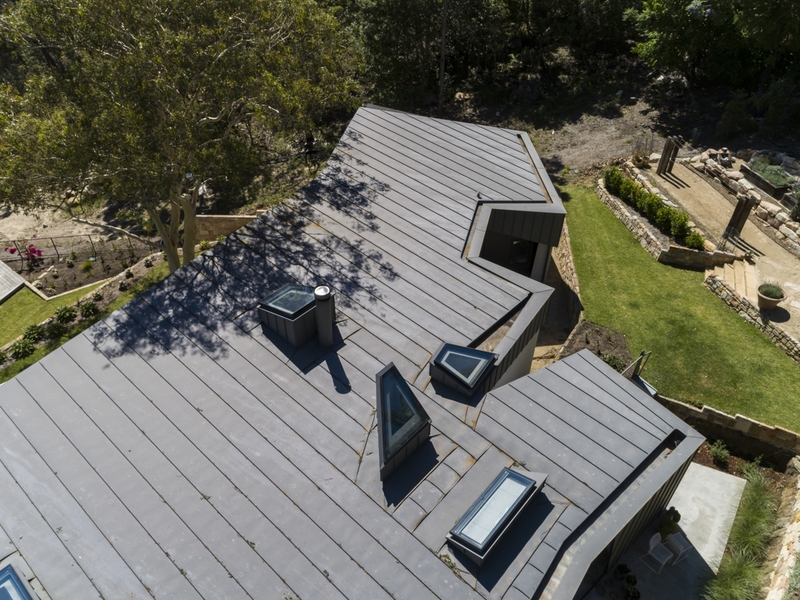 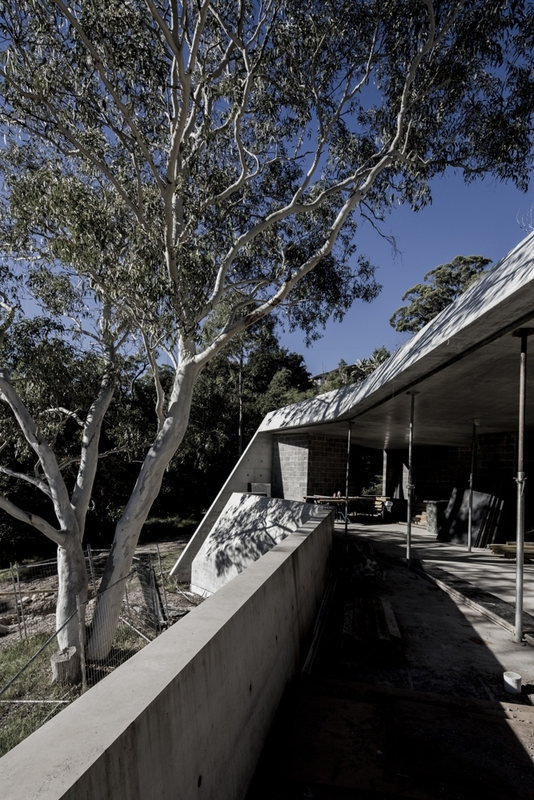 The history of the single-family house in Sydney during the last century is one that fuses an evolving approach to our relationship with the landscape with a history of experimentation in residential house design. 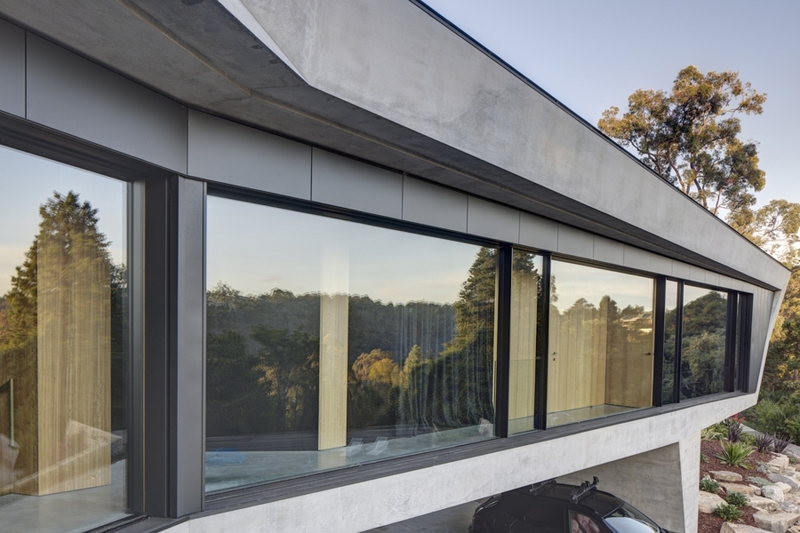 These two strands have come together most memorably in the occupation of the steep and often spectacular landscapes around the inner harbour and the modes of habitation made possible in the way these houses relate to their site and Sydney’s benign climate. 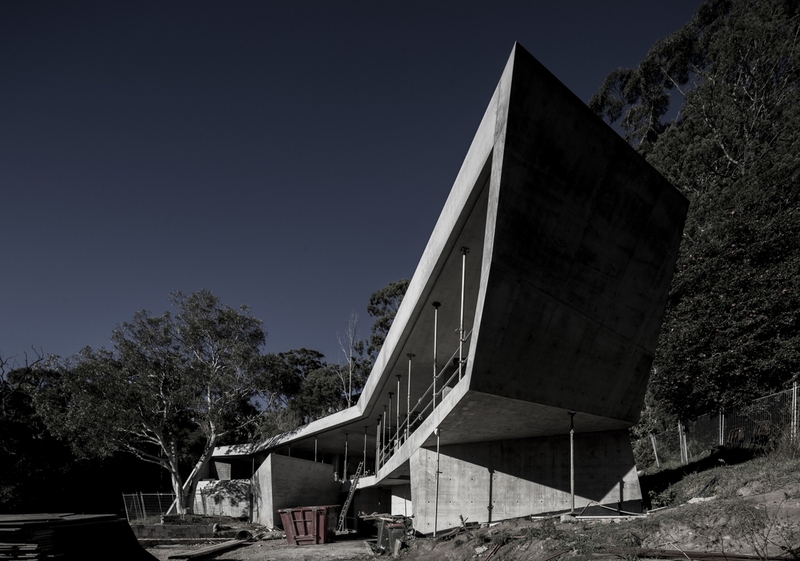 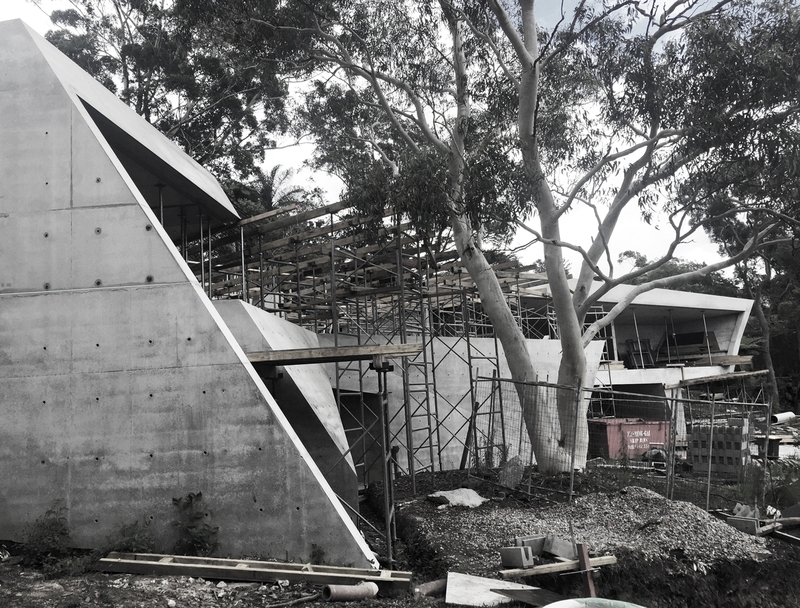 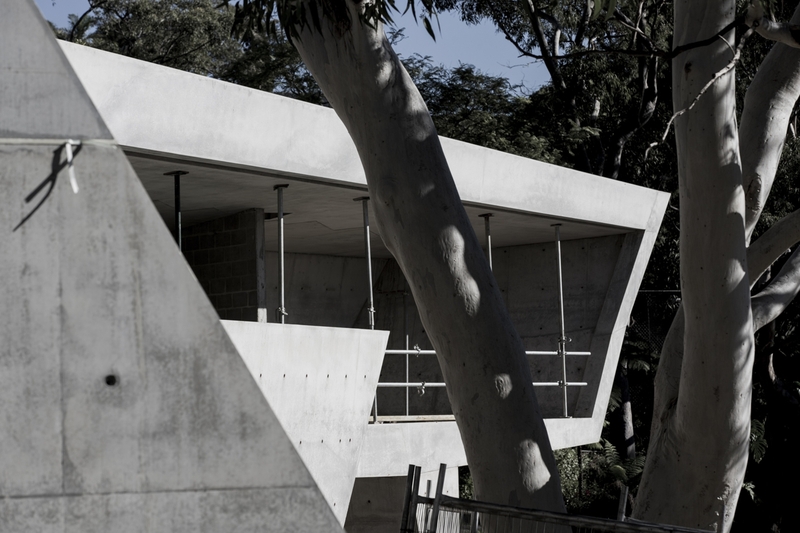 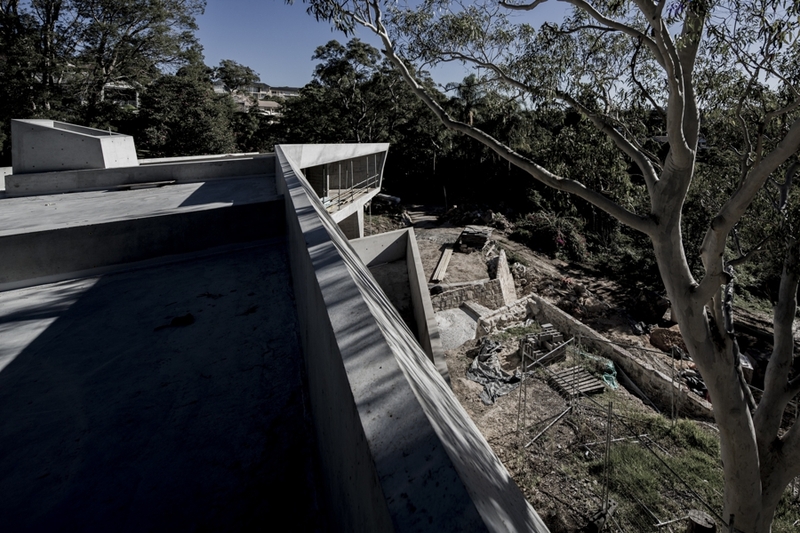 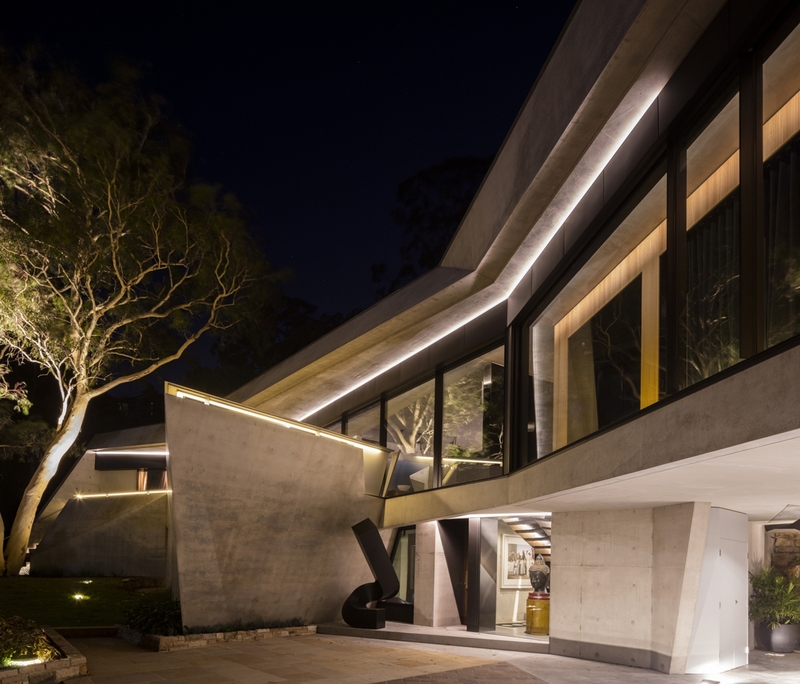 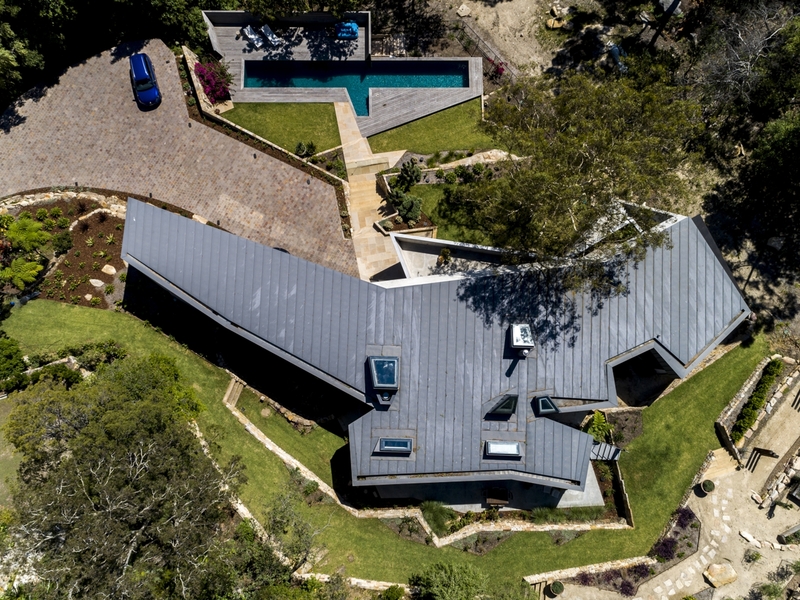 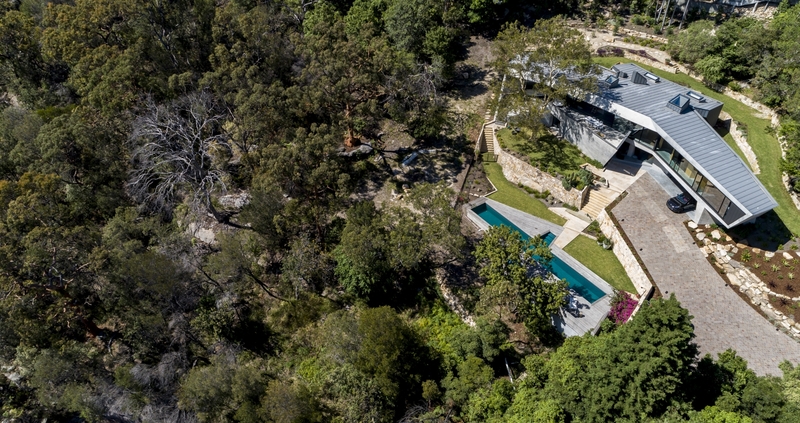 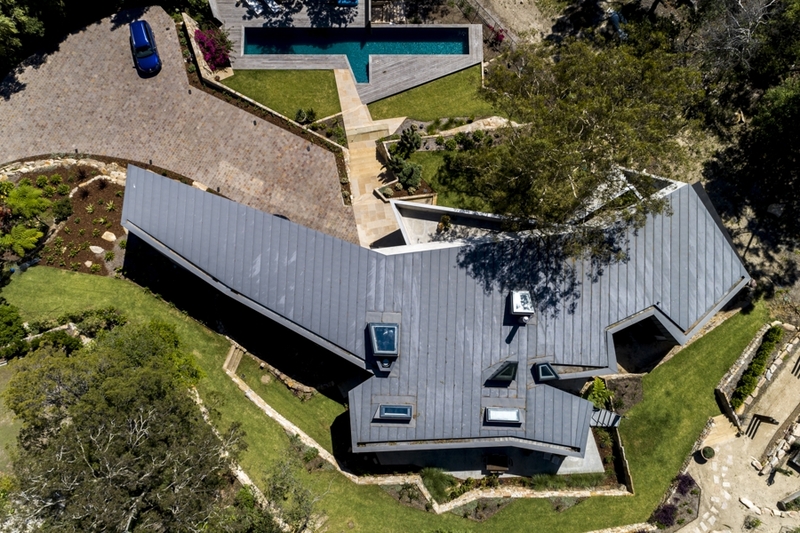 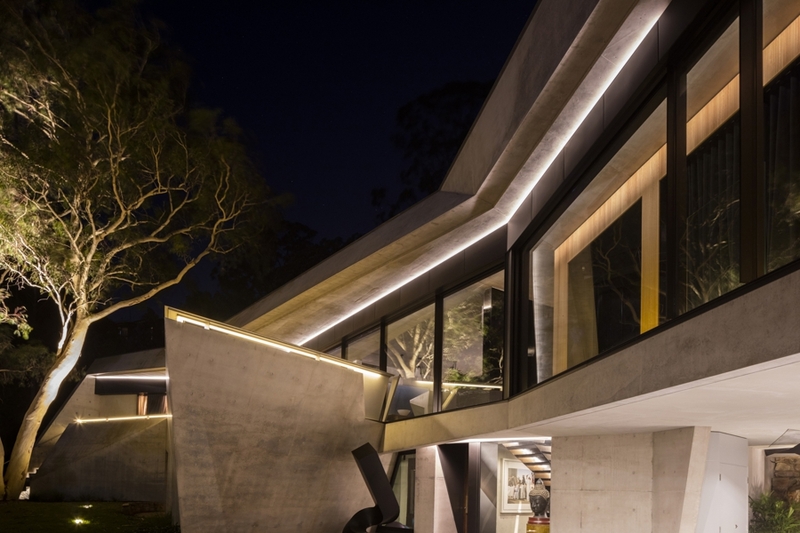 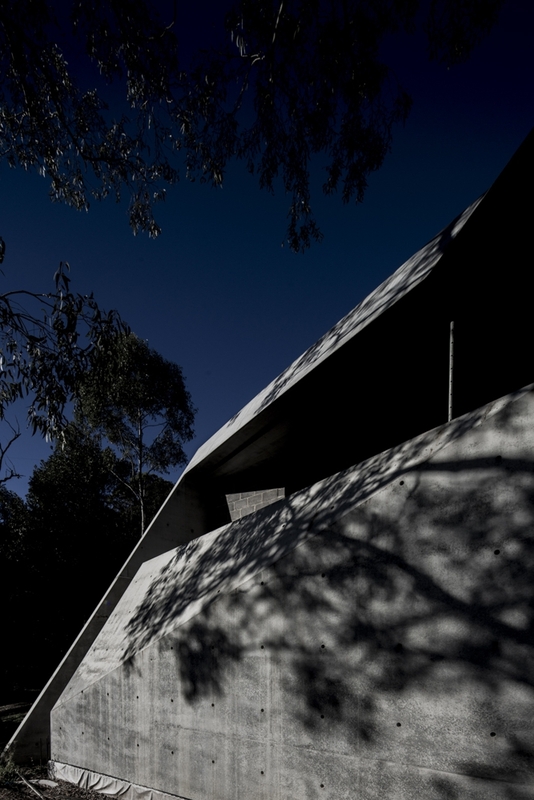 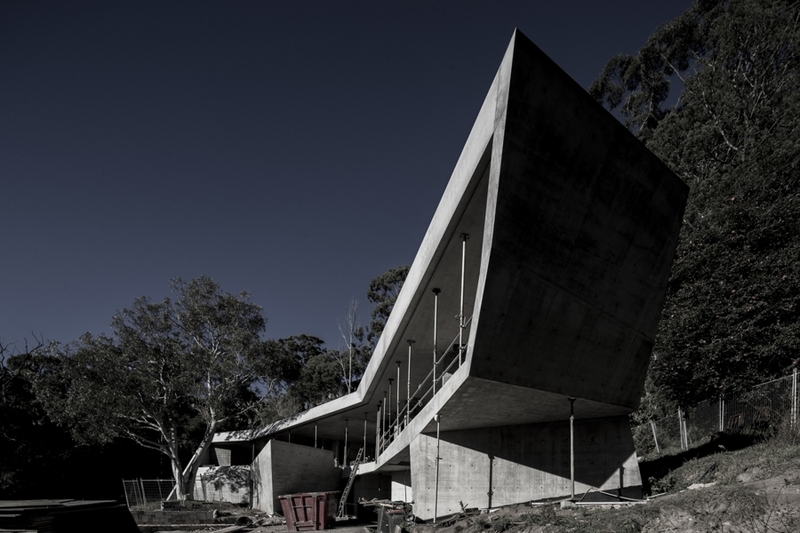 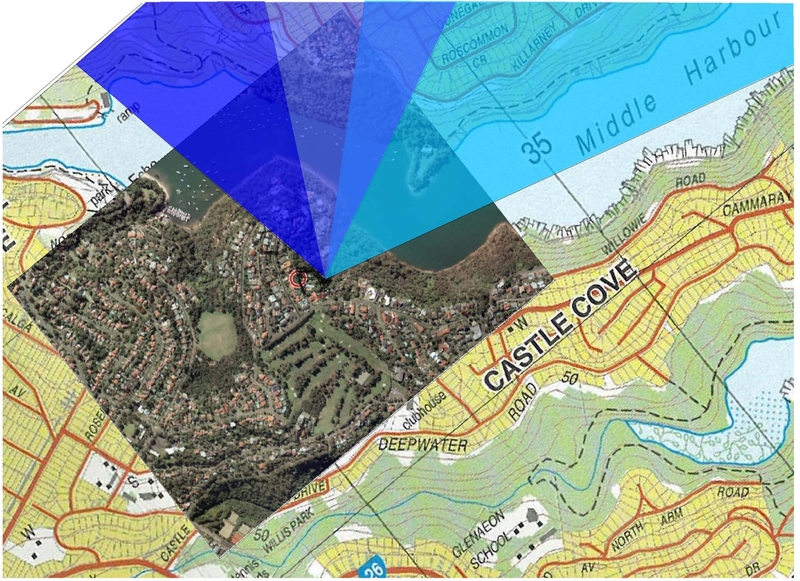 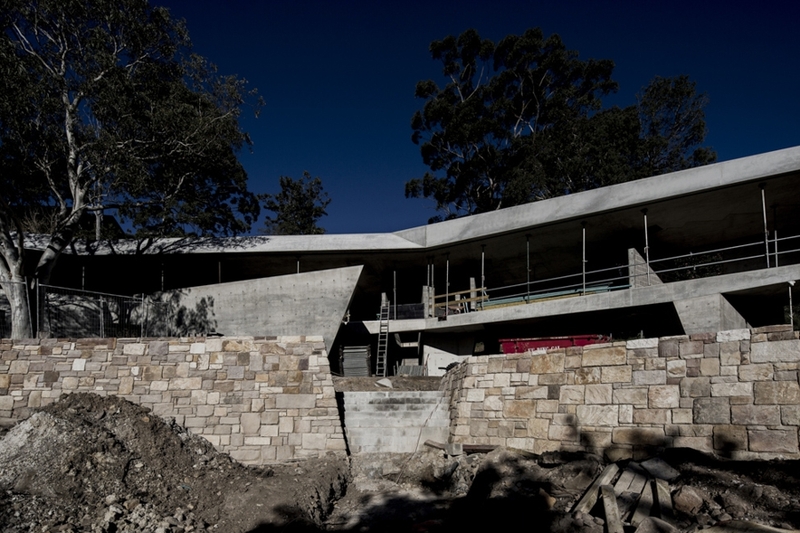 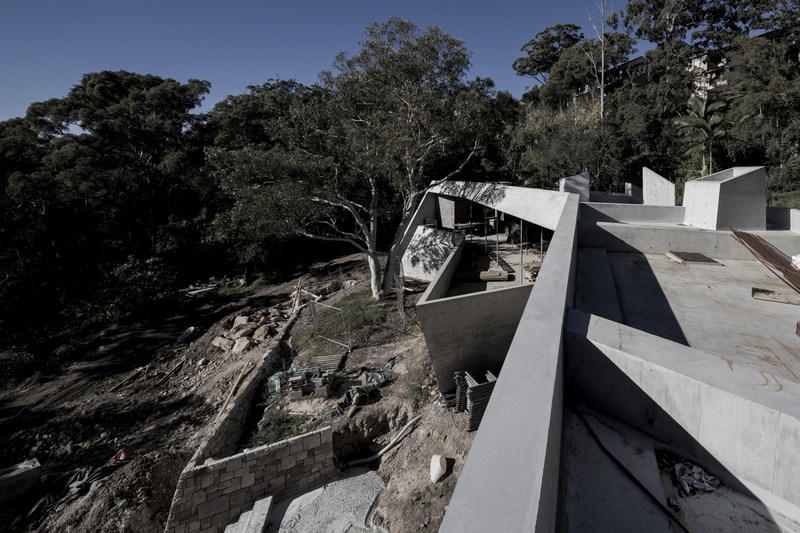 This project is sited in one of these classic Sydney contexts, Castle Cove, where steep, angophora-lined ravines contain tributaries that down to the harbour. 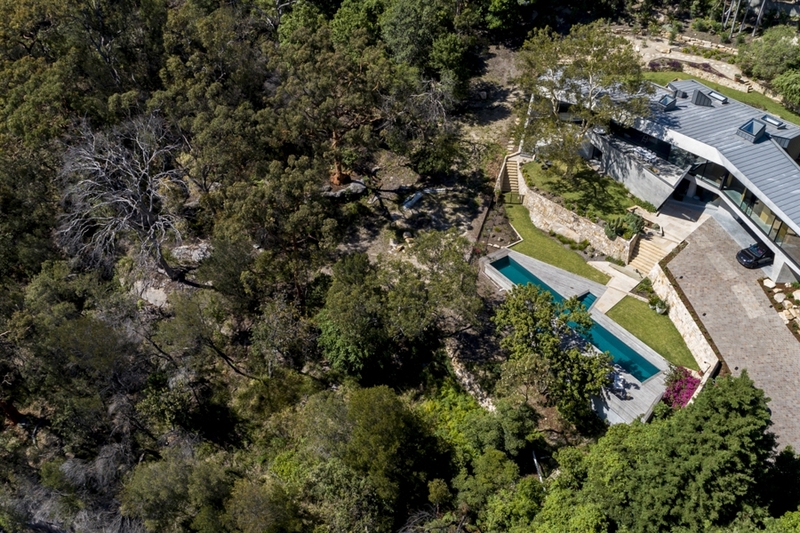 The sandstone geology is omnipresent and takes many forms, from mighty escarpments to minor ripples in the bedrock. 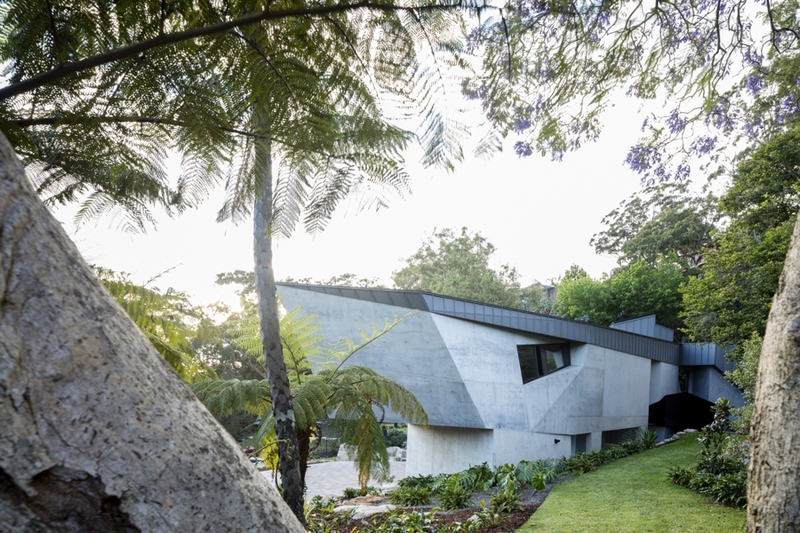 These landscape tectonics inform the design, where a concrete shell of irregular geometry steps around outcrops and contours, creating an indeterminate form that is distinctively new but also could equally be a strange object ‘unearthed’ in excavation. 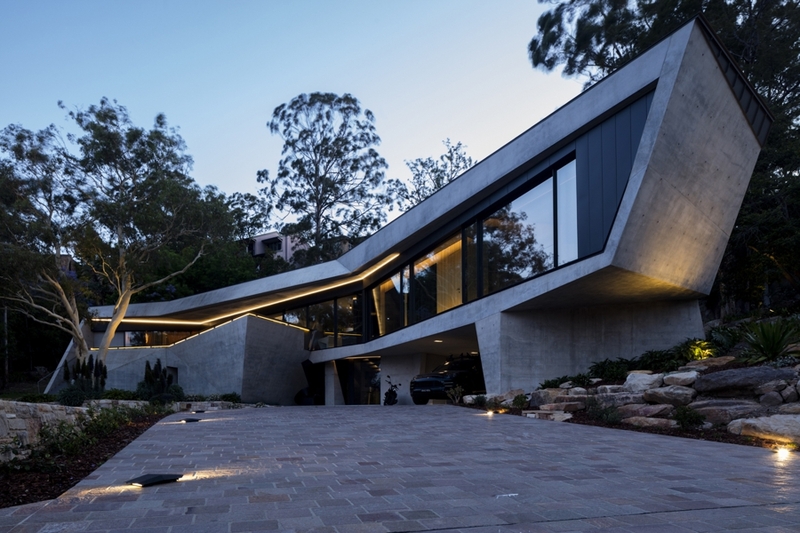 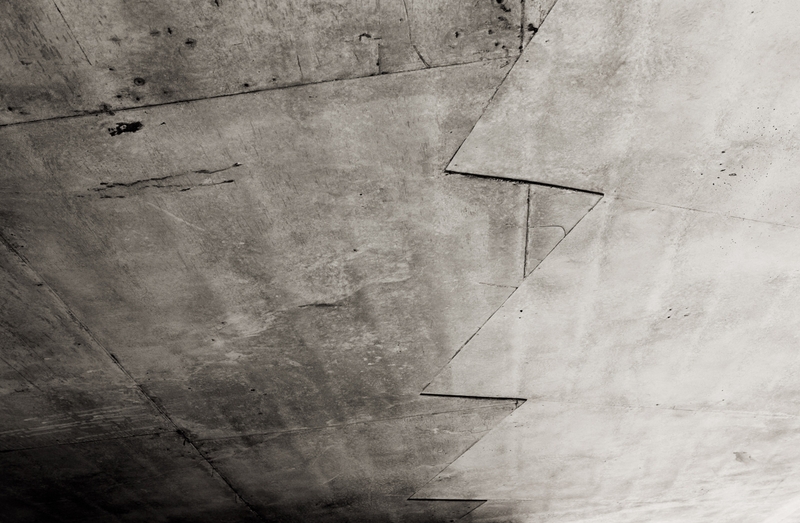 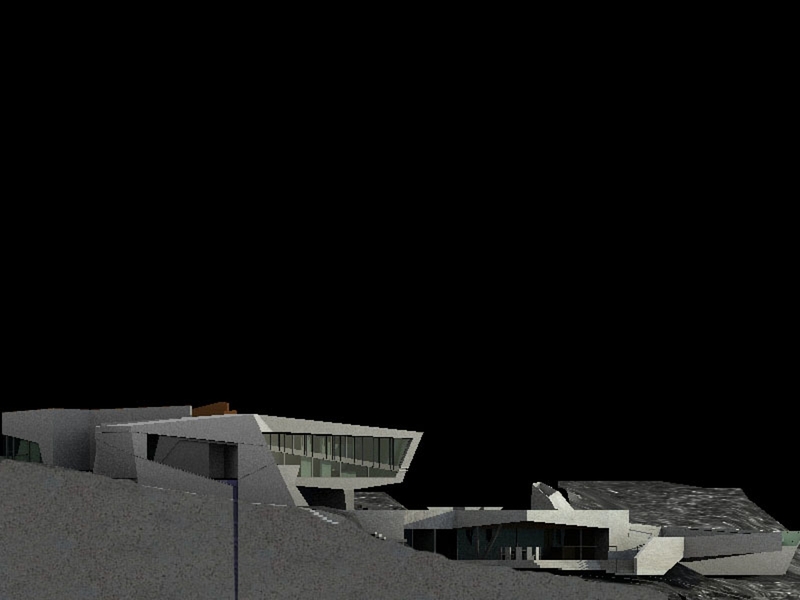 Either way, the concrete element is reverberates with the site geometry while forming a built escarpment that provides a plateau for habitation. 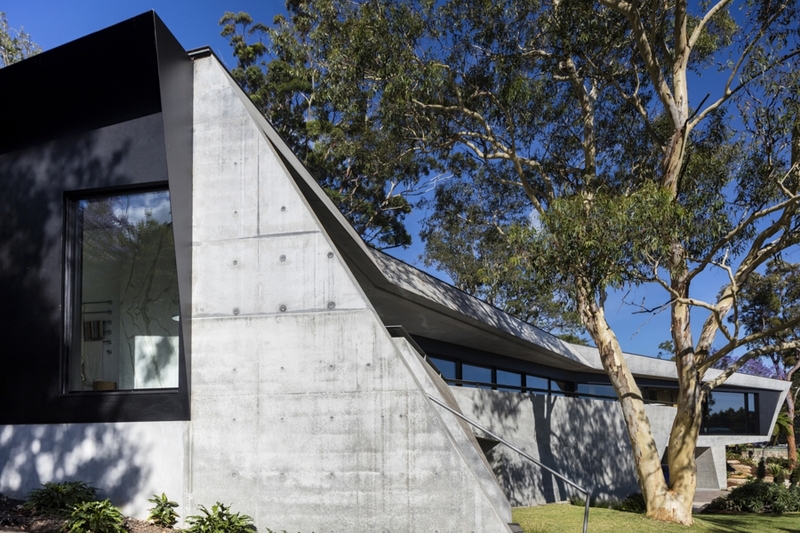 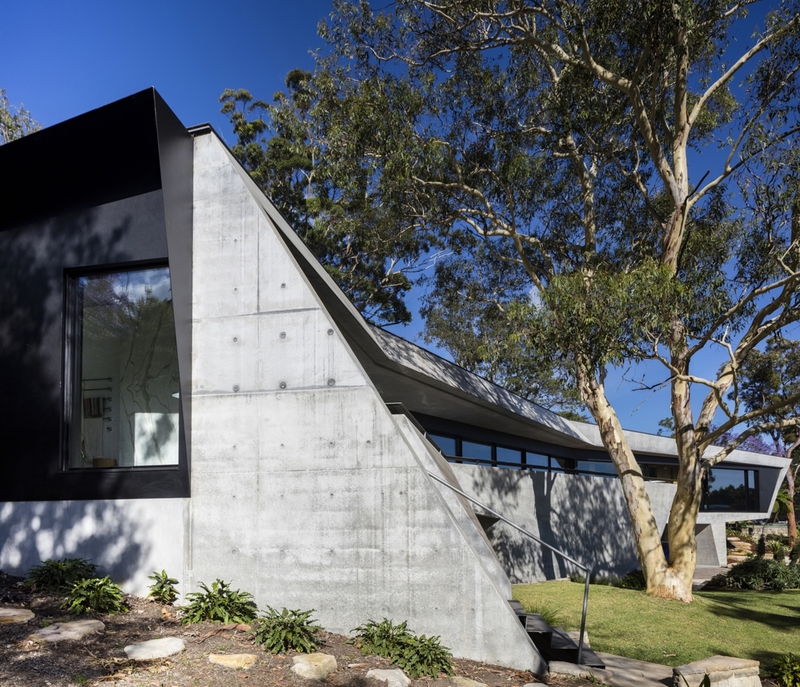 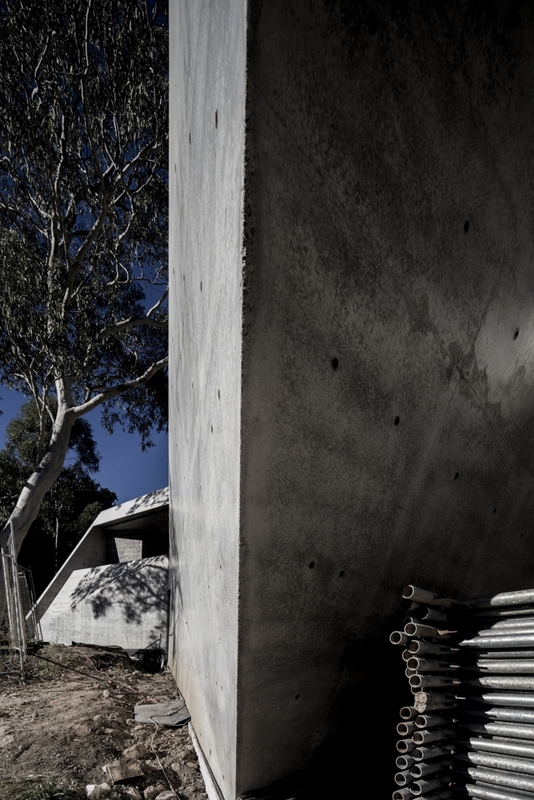 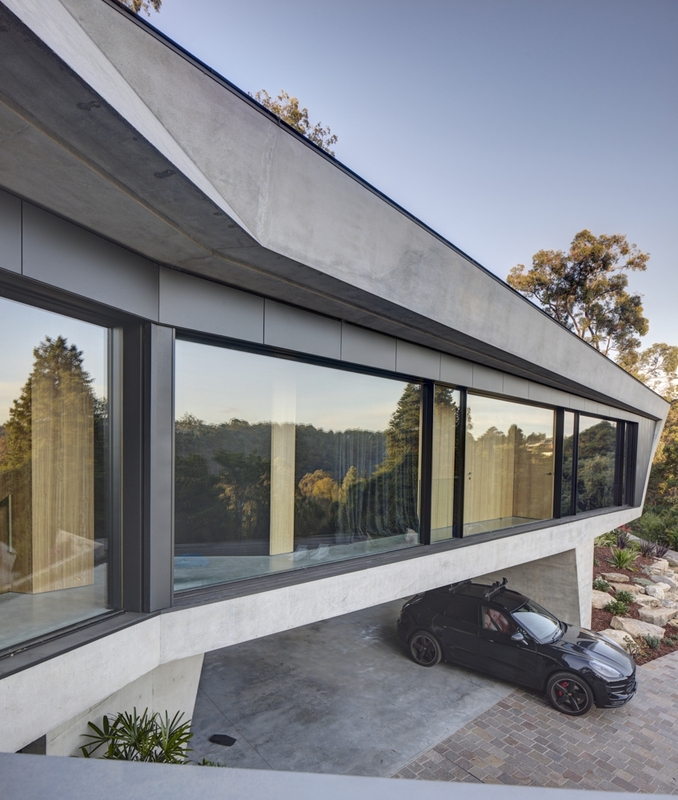 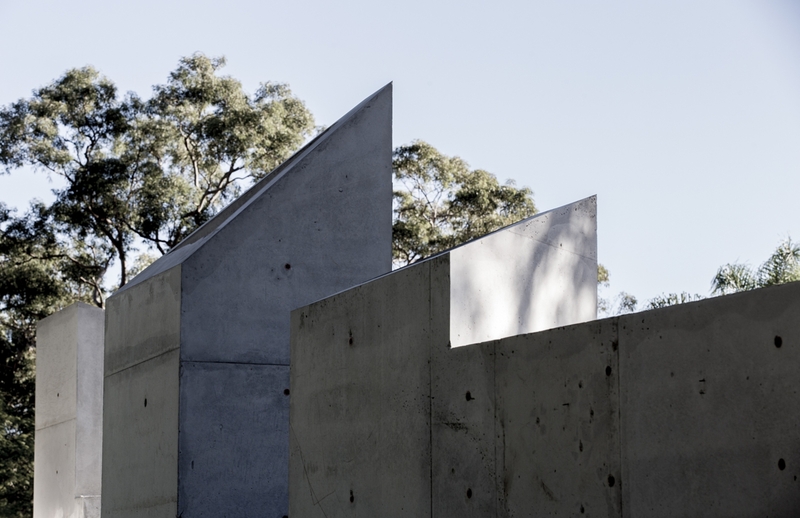 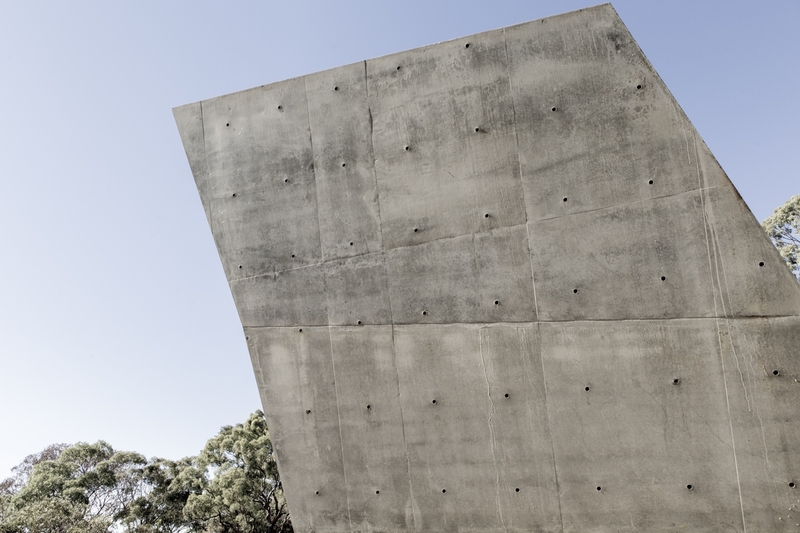 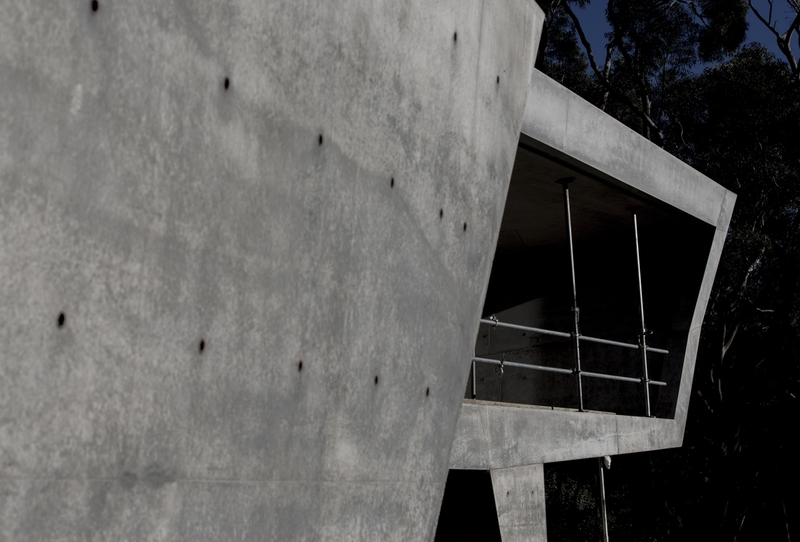 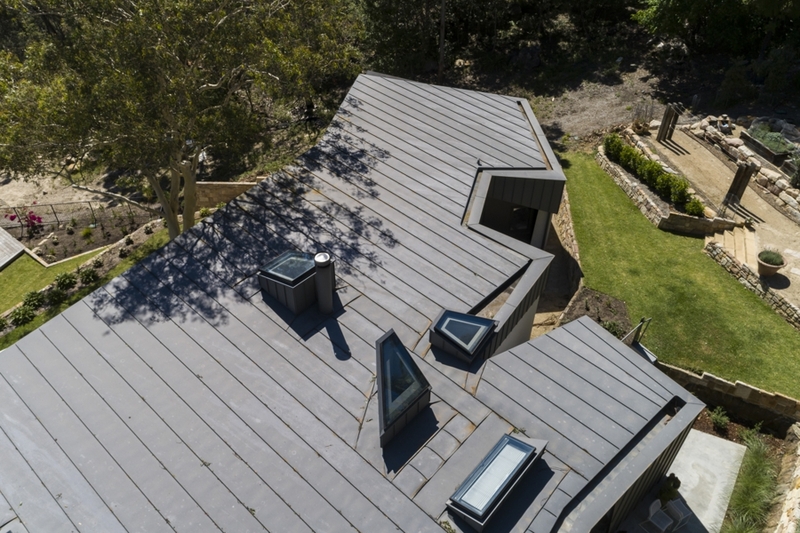 The concrete escarpment is roofed in a continuous zinc membrane that folds over to form a smaller pocket to the rear containing private rooms. 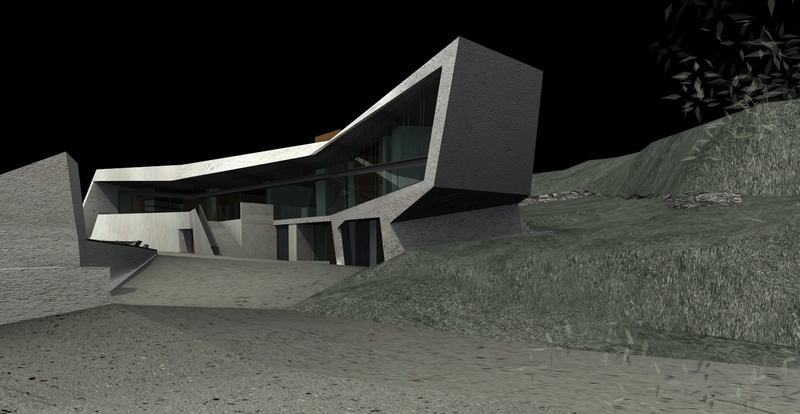 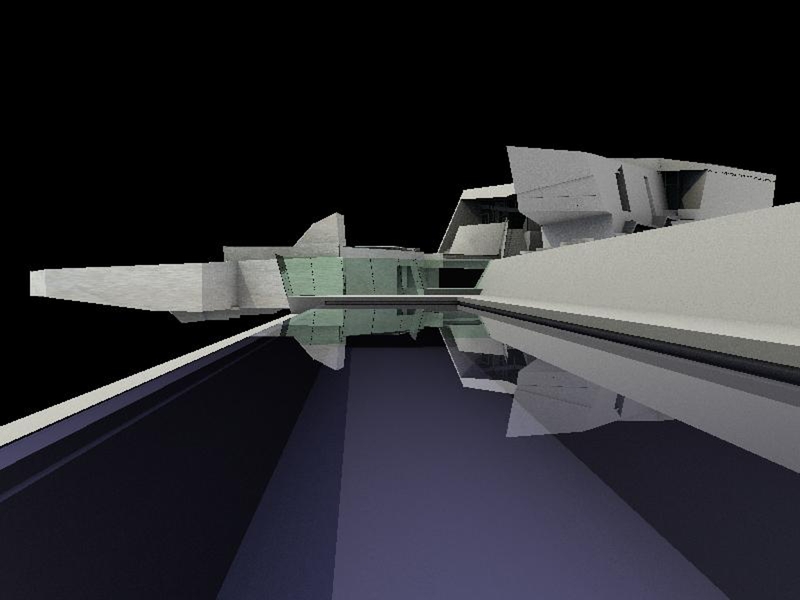 Both materials will patinate over time, moving again from a “new” to “pre-existing” form. 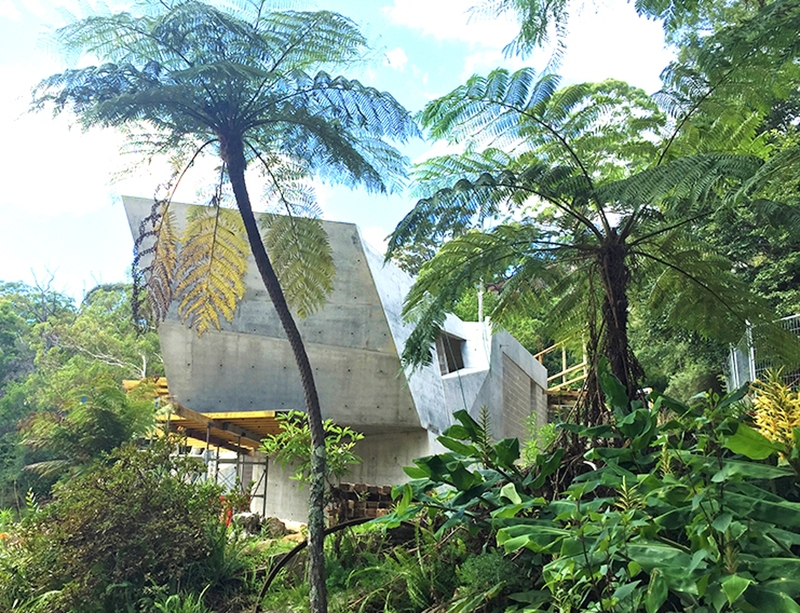 The infrastructural nature of this primary gesture has in its counterpoint the means of occupying the house through a series of crafted timber linings that enable the occupation of this concrete landscape with a spirit and glamour reminiscent of the California’s mid-century houses by John Lautner and others. 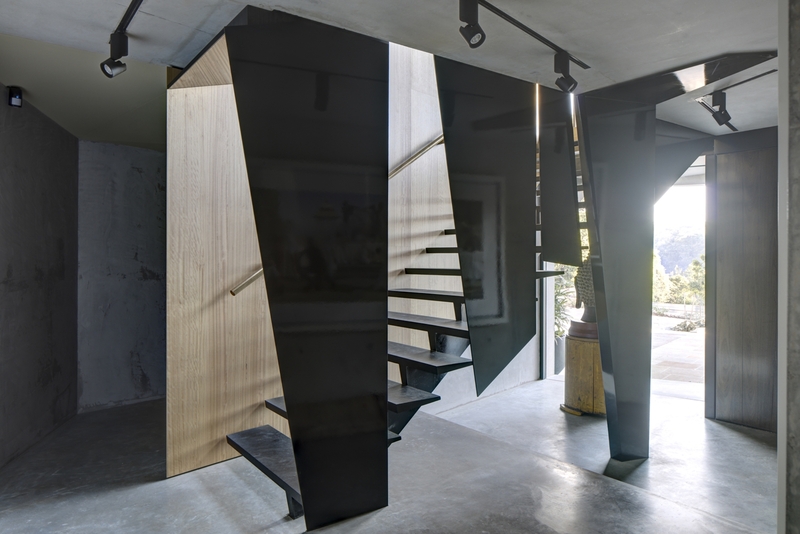 The resulting interior spaces connect inhabitants with the monumental and wonderous nature of the landscape yet still provide intimate moments for occupation that are so necessary for everyday life. These linings are further embellished with a number of steel, brass and mirror inserts that are like devices or instruments that start in the practical requirements of occupation, given their basis in linings, benches, windows and skylights. 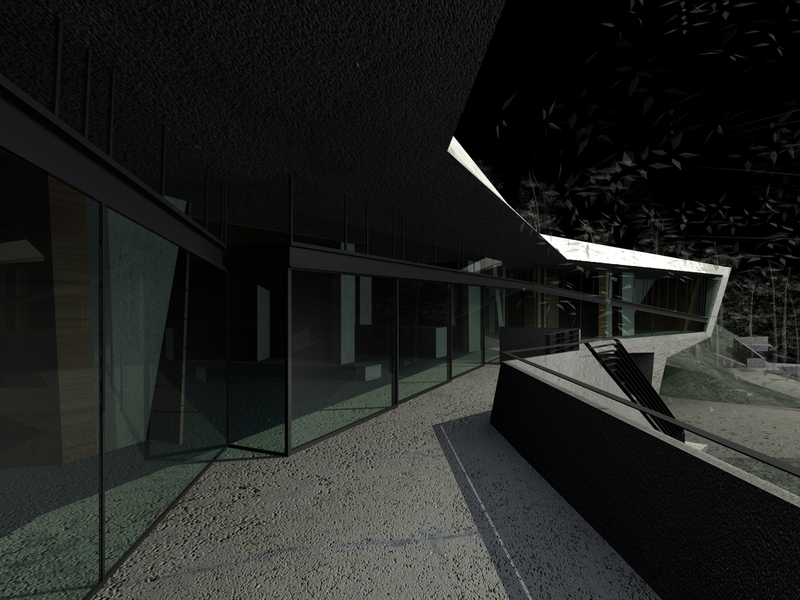 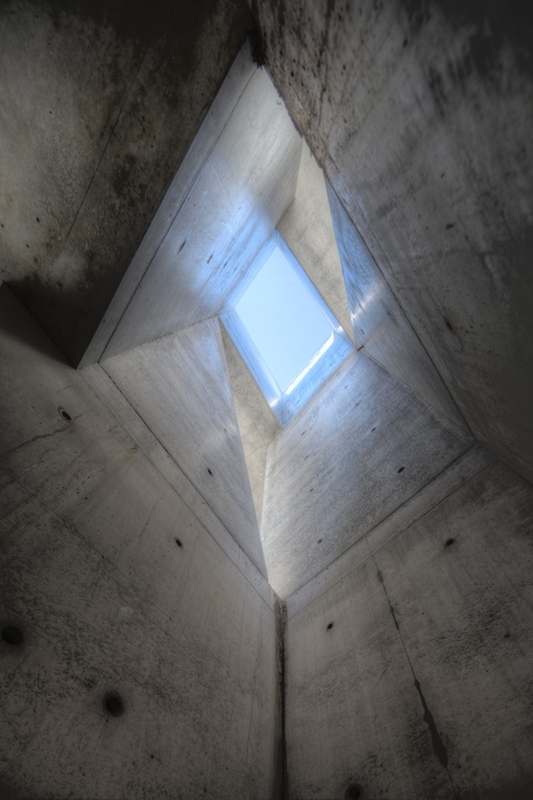 The common thread through each instrument is the further diffusion of the concrete container both physically (in fissures and pockets that increase its porosity) and perceptually (through mirrors, skylights passing through all levels, openings that limit acoustic privacy) that serve to mentally expand the scale of the building. 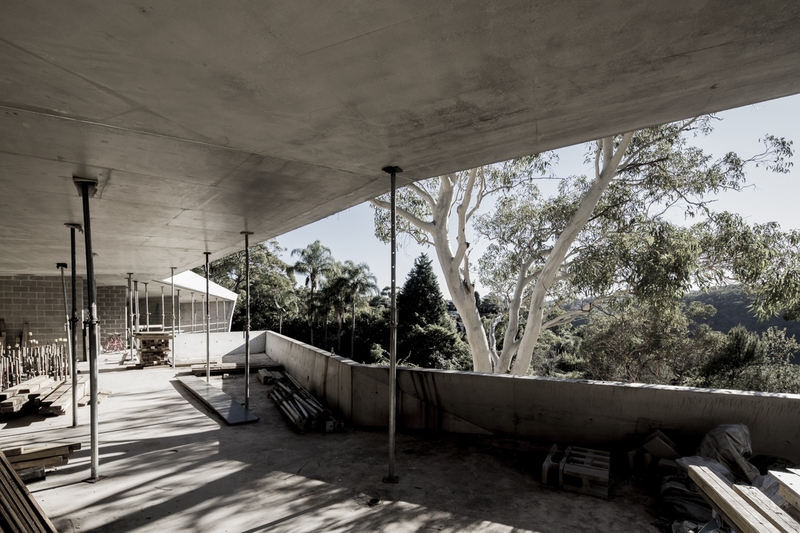 In every case, the instruments serve to intensify the relation between the occupants and landscape so directly established by the primary concrete form.